Colorful and fun hot plate. Will add remarkable character to any counter top. 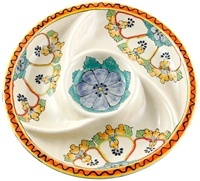 This elegant hand painted salad plate is lead free and dishwasher safe. 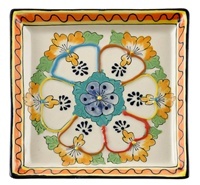 This elegant hand painted lunch plate is lead free and dishwasher safe. This square plate is great for salads and appitizers. This square plate is great for salads and appitizers. Great service tray for appertizers. Great service tray for appertizers. 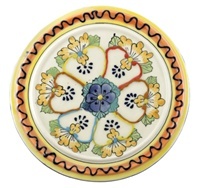 This elegant dinner plate is lead free and dishwasher safe. 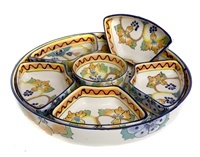 Great serving piece to add a little color to the dinner table. 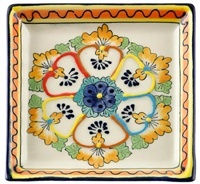 "Divided tray w/ compartments 12.5"" dia"
Hand painted in mexico, leadfree, micorwave and dishwasher safe!